Lots of cities have bicycle cops. Some cities even have Segway cops. 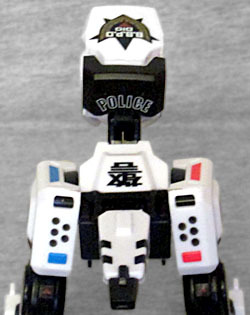 But sadly, no cities anywhere have cube cops. Imagine you were a criminal fleeing from the police, and suddenly this thing was catapulted into your path. (It's a bit hard to judge the intended scale of the toy, but the actual physical item is 1⅝" on a side. It could theoretically work for anything between Minimates and MotU Classics.) You definitely know it's something from the police, though, because it's black and white, with red and blue lights on top, and a big "BBPD" badge on the front. It doesn't explode, so you know it's not some weird grenade, and it doesn't start spraying tear gas or anything, so you assume the police are just trying to clobber you with something heavy. You dash past, thinking the worst is over, but then, behind you, you hear it: the sound of grinding gears and shifting metal. Something is happening to the cube. Stealing a glance back, you suddenly understand; the cops didn't just huck a metal box at you, they deployed a robotic dinosaur! 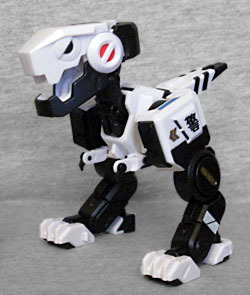 This little robosaurus is part of the Beast Box line from Topop/52toys - in fact, he's a repaint of BB-01, their first release. The plan is to make a whole series of figures that change from cubes to animals (thus the name "Beast Box"), and then offer up plenty of repaints to get some mileage out of the molds. While the original "Dio" was yellow and black, looking like a piece of construction equipment, I liked the police colors better. Other colors include the blue-and yellow "Ghost Dog," the Tron-y translucent "Neon Blue," and the translucent pink "Sakura," plus several other exclusives. Changing from a mech-box to a dinosaur is a simple series of four steps: unhook the sides of the box so you can rotate the legs and feet down into place, raise the tail and the head, and unfold the tiny arms. Obviously there's some wiggle room in how you choose to pose him, but figure he's approximately 3¼" tall. There's a lot of personality in the poses, thanks to a balljointed head, hinged jaw, hinged neck, balljointed hips, a hinged tail, two joints in each arm, and swivels in the toes and heels. Getting the arms out is tough, since they're so small - you'd better hope you haven't cut your fingernails recently. Also, if the tail isn't raised high enough, it tends to snap back down into its folded position. The insert behind the figure in the packaging calls out lots of technical specifcations, like the 8GHz CPU, the battery, and the flamethrower. Clearly this is all just pretend, but at least now you'll learn that he has nares. And that "nares" is another word for nostrils! There isn't a ton of detail in the surface sculpt - they didn't go overboard trying to craft tiny rivets and screws or anything, just a few panel lines and raised elements. 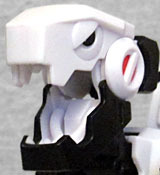 There are pistons on his neck and tubing inside the mouth, and overall it makes for a pleasant looking toy. The paint is applied well. Dio is still mainly black and white, with the red and blue bars on his hips looking like emergency lights. 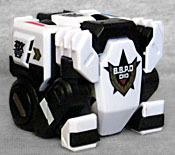 The BBPD logo (which we can now assume stands for "Beast Box Police Department") ends up on top of Dio's head, and the word "police" is on the back. There's some sort of Chinese writing on the body and hips, but no one ever answers our request for translation help, so we can't tell you for sure what it says. There are red elements on his cheeks, and gold on the knees to complement the chevrons on the hips. 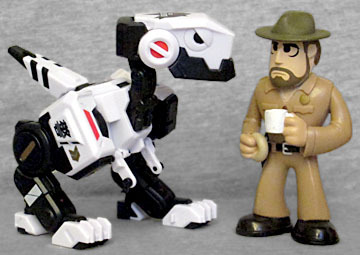 The second Beast Box figure, an ape named Jojo, is out, and the third, Moma the mammoth, will be on his way soon (plus there's already a design for the fourth figure, a triceratops). Dio is a fun little figure, and if the others get BBPD decos to match him, I might end up building an entire police force.